Why Choose Asheford For Appraisal Education & Certification? The Asheford Institute Of Antiques "Certified Appraisers Foundation" (CAF), was established in 1967, and was incorporated into the Asheford Course as an integral part of the school's educational curriculum on antiques and collectibles later that same year. It was designed to offer students of the Institute the chance to expand their knowledge and vocational base into the field of "decorative arts appraising," through a set of principles, theories and methodologies, that would later become known as The Professional Appraiser Code of Conduct (PACC). The incorporation of the CAF within the Asheford Program, allowed the Institute to foster and develop a new set of academic standards and principles for those interested in becoming certified professional-level appraisers. These new principles were brought about by the need to harmonize and bring together the various entities within the world of the decorative arts - to ensure that dealers of glass knew something of furniture, that collectors of porcelain knew something of wood, that restorers knew something of age and provenance, and that appraisers knew a little of everything. It was an idea predicated on joining the various disciplines of the antiques and decorative arts community under one umbrella. A chance to offer students professional educational training into all facets of the antiques and collectibles marketplace - including appraising. After more than half a century of implementation, and thousands of graduates later, the Asheford appraisal program, with its "Professional Appraiser Code of Conduct" (PACC), continues to impress with its highly developed curriculum, innovative training techniques, and its comprehensive testing practices. Asheford appraisers continue to exhibit the uppermost form of professional conduct, and represent the finest degree of excellence within their respective fields of endeavor. What Puts Asheford Appraisers On Top? What distinguishes Asheford appraisers from everyone else comes down to one simple concept... training. Students at the Institute who are interested in becoming appraisers in the decorative arts field must first complete the entire Asheford Program on “product knowledge” (the study of antiques, collectibles and memorabilia), before they can even begin to work on the “methodology” practices (PACC rules, theory and regulations) that are associated with appraising. Although prior experience in the antiques and collectibles field can be an asset in this process, it is simply not enough of a credential to warrant certification as a professional-level appraiser. In today’s marketplace, appraisers must now demonstrate to prospective clients, a degree of formal training and study in their respective field, just as an engineer, doctor, or any other professional would. The Asheford Institute is the only program of its kind that requires a two-fold approach to instruction and training, in order to certify its students as "Professional-level" Appraisers. Q: "Am I going to be trained in all areas of the decorative arts - including antiques, collectibles, memorabilia, vintage, mid-century modern and specialty fields such as paintings?" A: Yes, the Asheford Program will train you not just in methodology techniques, but in actual "item knowledge" as well. Q: "Will the Course curriculum I'm going to undertake be sufficient enough to thoroughly instruct me in these fields of study?" A: Yes, at over 2,600 "actual" online pages, along with embedded videos, pop-up photos, interactive multimedia displays, and direct-connect links within the e-Course; you will receive all the necessary instruction to be able to garner a complete and thorough understanding of all major subject areas within the decorative arts (see our Course Outline page). Q: "What about operating my own Appraisal Business, do you help with that as well?" A: Yes, the Asheford Course is divided into four main areas of study: Pleasure (the study of antiques and the decorative arts), Appraising (methodology practices and how to conduct appraisals), Profit, (the setting-up and operation of an antiques, estate sale and appraisal business), and Care & Restoration. These four main areas of study are what constitute the "core" educational themes within the Asheford Program. Q: "What is the difference between the Asheford Institute and appraisal organizations or groups?" A: The Asheford Institute is a school that trains and certifies individuals on how to be appraisers within the decorative arts field, in much the same way one would train to be an accountant or lawyer. We impart the knowledge necessary for leaning right from square-one. Your past experience or knowledge within this field may potentially be helpful, but does not contribute on its own to the credentialing process for certification. As a result, the educational standardization employed by Asheford, allows students to succeed in this endeavor through the implementation of a curriculum that is focused on helping one achieve the designation of "Certified A.I.A. Appraiser," through a unified and comprehensive testing, training and review process. We thoroughly educate you first, before ever handing out a credential that states you are certified. Q: Do you offer actual examples of appraisals so that I'm able to see how they're constructed and presented?" A: Yes, you'll find numerous examples of actual appraisals throughout your Course of study. These appraisals are designed to guide you with step-by-step instructions on how to construct your own "professional-level appraisals." Each sample appraisal contains notes and reference points to guide you along the way. And, should you have any questions, you're always free to contact the Institute at any time for help. Until recently, the primary client for most appraisers was usually an individual. However, today's appraisers are just as likely to be hired by organizations such as banks (for content evaluations related to liquidations), attorneys, real estate agents, insurance companies, online evaluation sites, antique trade publications (as columnists), estate sale representatives, auction houses and even revenue collection agencies, such as the IRS and Revenue Canada (CRA). However, many of these organizations are now requiring that appraisers meet an entirely new set of professional criteria, based on updated standards of testing and certification in order to conduct personal property evaluations. The Asheford Program not only meets these requirements, but exceeds them in virtually every respect - students are not only taught methodology principles, but they can also demonstrate to prospective clients that they have a comprehensive and thorough understanding of actual product knowledge as well. The Asheford two-fold approach to instruction within the field of appraising allows clients to see that graduates of the Institute not only have theoretical training in the principles behind evaluation, but that they are also well versed in the practical recognition of the items that are actually being appraised. To large organizations such as banks, insurance companies, law firms etc., this standardization of knowledge and testing required of Asheford students is an invaluable asset. Simply put, it instills confidence and belief in their decision making process when it comes to hiring appraisers from the Institute. Who Are Today's Asheford Appraisers? With thousands of appraisers around the globe, our student base is as diverse as it is knowledgeable. 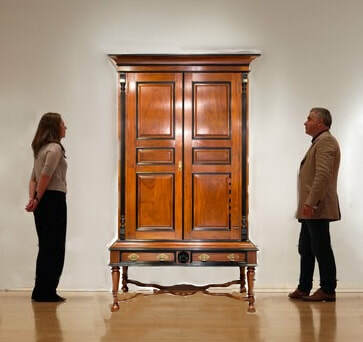 Asheford graduates represent an international association of professional-level appraisers (CAF), whose expertise in the field of antiques, collectibles, and all areas of the decorative arts, is unrivaled. With an exceptionally high degree of specialization within virtually every aspect of the antiques marketplace, Asheford appraisers are more than qualified when it comes to today's demanding client expectations. Our appraisers are widely regarded as "the best" in their field, with many holding posts at universities, curatorships at museums, working as appraisal experts for antique trade publications, as auction house specialists, and even as "consulting experts" on major network television shows related to antiques and collectibles. Whether they're representing a high-profile international client, or simply appraising locally in their own community, all Asheford appraisers are backed by the same ethos everywhere: "The application of Experience, Knowledge, Honesty, Professionalism, and Diligence... above all else. " Below, you'll find two of the school's top appraisal graduates who are currently working as "Ask The Experts," for one of the nation's leading antique trade publications. To read some of their reviews, simply click on their image. Would You Like To Become An Asheford Appraiser? If becoming an appraiser and working within the field of the decorative arts is something that you've always thought about. Or, you're currently operating your own antique business, or estate sale service, but would like to branch out into the field of professional-level appraising, or perhaps you're already an appraiser, but would like to be professionally certified by the Institute - then don't wait - call today and ask to speak to a Course Specialist. Our experts are no more than a phone call away, and can explain all the benefits you'll receive upon being designated as a Certified Appraiser of the Asheford Institute. Or, to get started immediately, simply contact the Registrar's Office (toll free: 877-444-4508), and they'll be glad to assist you with your enrollment application. "For over half a century we've been teaching students about antiques, collectibles and appraising... our students succeed, because we know what works!"